A dam is a barrier across flowing water that obstructs, directs, or slows the flow, often creating a reservoir, lake, or impoundment. In Australian and South African English, the word dam may refer to the reservoir as well as the barrier. Most dams have a section called a spillway or weir that allows water to flow out, either intermittently or continuously. A dam may serve one or more purposes, such as to provide water for neighboring towns, farms, and industries, to produce hydroelectric power, to improve navigation, to control flooding, and to maintain wildlife habitats. On the downside, a dam may adversely affect the area's ecosystem and destabilize geological formations. The construction of a large dam may force the relocation of many local inhabitants, and structural failure of a dam can have catastrophic effects. The building and maintenance of a dam needs to take these factors into consideration. A cross-section of a hydroelectric dam. The word dam can be traced back to Middle English, and before that, from Middle Dutch, as seen in the names of many old cities in the Netherlands. Most of the first Dams were built in Mesopotamia up to 7,000 years ago. These were used to control the water level, for Mesopotamia's weather affected the Tigris and Euphrates rivers and could be quite unpredictable. The earliest recorded dam is believed to have been on the Sadd Al-Kafara at Wadi Al-Garawi, which is located about 25 kilometers south of Cairo, and built around 2600 B.C.E. It was destroyed by heavy rain shortly afterwards. The oldest standing dam in the world is believed to be the Grand Anicut, also known as the Kallanai, built on the Kaveri River (or Cauvery River) in the state of Tamil Nadu in southern India. It was built by the Chola king Karikalan, and dates back to the second century C.E. Du Jiang Yan in China is the oldest surviving irrigation system that includes a dam to direct water flow. It was completed in 251 B.C.E. The Kallanai is a massive dam of unhewn stone, over 300 meters long, 4.5 meters high, and 20 meters wide, across the main stream of the Cauvery. The purpose of the dam was to divert the waters of the Cauvery across the fertile delta region for irrigation via canals. The dam is still in good condition and has served as a model for later engineers, including the Sir Arthur Cotton's nineteenth-century dam across the Kollidam, the major tributary of the Cauvery. The land area irrigated by the ancient irrigation network, of which the dam was the centerpiece, was 69,000 acres (280 square kilometers). By the early twentieth century, the irrigated area had been increased to about 1,000,000 acres (4,000 square kilometers). Sunshu Ao, Prime Minister of the state of Chu of ancient China, was China's first known hydraulic engineer. He served Duke Zhuang of Chu during the reign of King Ding of Zhou (606 B.C.E.-586 B.C.E. ), ruler of the Eastern Zhou Dynasty. His large earthen dam flooded a valley in modern-day northern Anhui province to create an enormous irrigation reservoir (62 miles in circumference), which still exists today. In the Netherlands, a low-lying country, dams were often applied to block rivers to regulate the water level and to prevent the sea from entering the marshlands. Those dams often marked the beginning of a town or city because it was easy to cross the river such locations, often giving rise to the respective place's names in Dutch. For instance, the Dutch capital Amsterdam (old name Amstelredam) started with a dam through the river Amstel in the late twelfth century, and Rotterdam started with a dam through the river Rotte, a minor tributary of the Nieuwe Maas. The central square of Amsterdam, believed to be the original place of the 800 year old dam, still carries the name Dam Square. Dams can be formed by human agency or natural causes, including the intervention of wildlife such as beavers. Man-made dams are typically classified according to their size (height), intended purpose, or structure. International standards define large dams as those higher than 15 meters and major dams as those over 150 meters in height. to contain effluents from sites such as mines or factories. Few dams serve all these purposes, but some serve more than one purpose. A saddle dam is an auxiliary dam constructed to confine the reservoir created by a primary dam either to permit a higher water elevation and storage or to limit the extent of a reservoir for increased efficiency. An auxiliary dam is constructed in a low spot or saddle through which the reservoir would otherwise escape. On occasion, a reservoir is contained by a similar structure called a dike to prevent inundation of nearby land. Dikes are commonly used for reclamation of arable land from a shallow lake. This is similar to a levee, which is a wall or embankment built along a river or stream to protect adjacent land from flooding. An overflow dam is designed for water to flow over its top. A weir is a type of small overflow dam that can be used for flow measurement. A check dam is a small dam designed to reduce flow velocity and control soil erosion. Conversely, a wing dam is a structure that only partly restricts a waterway, creating a faster channel that resists the accumulation of sediment. A dry dam is a dam designed to control flooding. It normally holds back no water and allows the channel to flow freely, except during periods of intense flow that would otherwise cause flooding downstream. A diversionary dam is a structure designed to divert all or a portion of the flow of a river from its natural course. Based on structure and material used, dams are classified as timber dams, embankment dams or masonry dams, with several subtypes. 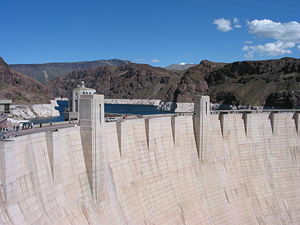 Hoover Dam, a concrete gravity-arch dam in the Black Canyon of the Colorado River. In the arch dam, stability is obtained by a combination of arch and gravity action. If the upstream face is vertical the entire weight of the dam must be carried to the foundation by gravity, while the distribution of the normal hydrostatic pressure between vertical cantilever and arch action will depend upon the stiffness of the dam in a vertical and horizontal direction. When the upstream face is sloped the distribution is more complicated. The normal component of the weight of the arch ring may be taken by the arch action, while the normal hydrostatic pressure will be distributed as described above. For this type of dam, firm reliable supports at the abutments (either buttress or canyon side wall) are more important. The most desirable place for an arch dam is a narrow canyon with steep side walls composed of sound rock. The safety of an arch dam is dependent on the strength of the side wall abutments, hence not only should the arch be well seated on the side walls but also the character of the rock should be carefully inspected. Two types of single-arch dams are in use, namely the constant-angle and the constant-radius dam. The constant-radius type employs the same face radius at all elevations of the dam, which means that as the channel grows narrower towards the bottom of the dam the central angle subtended by the face of the dam becomes smaller. Jones Falls Dam, in Canada, is a constant radius dam. In a constant-angle dam, also known as a variable radius dam, this subtended angle is kept a constant and the variation in distance between the abutments at various levels are taken care of by varying the radii. Constant-radius dams are much less common than constant-angle dams. Parker Dam is a constant-angle arch dam. A similar type is the double-curvature or thin-shell dam. Wildhorse Dam near Mountain City, Nevada in the United States is an example of the type. This method of construction minimizes the amount of concrete necessary for construction but transmits large loads to the foundation and abutments. The appearance is similar to a single-arch dam but with a distinct vertical curvature to it as well lending it the vague appearance of a concave lens as viewed from downstream. The multiple-arch dam consists of a number of single-arch dams with concrete buttresses as the supporting abutments. The multiple-arch dam does not require as many buttresses as the hollow gravity type, but requires good rock foundation because the buttress loads are heavy. The Gilboa Dam in the Catskill Mountains of New York State is an example of a "solid" gravity dam. In a gravity dam, stability is secured by making it of such a size and shape that it will resist overturning, sliding and crushing at the toe. The dam will not overturn provided that the moment around the turning point, caused by the water pressure is smaller than the moment caused by the weight of the dam. This is the case if the resultant force of water pressure and weight falls within the base of the dam. However, in order to prevent tensile stress at the upstream face and excessive compressive stress at the downstream face, the dam cross section is usually designed so that the resultant falls within the middle at all elevations of the cross section (the core). For this type of dam, impervious foundations with high bearing strength are essential. When situated on a suitable site, a gravity dam inspires more confidence in the layman than any other type; it has mass that lends an atmosphere of permanence, stability, and safety. When built on a carefully studied foundation with stresses calculated from completely evaluated loads, the gravity dam probably represents the best developed example of the art of dam building. This is significant because the fear of flood is a strong motivator in many regions, and has resulted in gravity dams being built in some instances where an arch dam would have been more economical. Gravity dams are classified as "solid" or "hollow." The solid form is the more widely used of the two, though the hollow dam is frequently more economical to construct. Gravity dams can also be classified as "overflow" (spillway) and "non-overflow." Grand Coulee Dam is a solid gravity dam and Itaipu Dam is a hollow gravity dam. 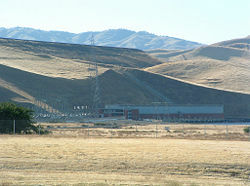 The San Luis Dam near Los Banos, California is an embankment dam. Rock-fill dams are embankments of compacted free-draining granular earth with an impervious zone. The earth utilized often contains a large percentage of large particles hence the term rock-fill. The impervious zone may be on the upstream face and made of masonry, concrete, plastic membrane, steel sheet piles, timber or other material. The impervious zone may also be within the embankment in which case it is referred to as a core. In the instances where clay is utilized as the impervious material the dam is referred to as a composite dam. To prevent internal erosion of clay into the rock fill due to seepage forces, the core is separated using a filter. Filters are specifically graded soil designed to prevent the migration of fine grain soil particles. When suitable material is at hand, transportation is minimized leading to cost savings during construction. Rock-fill dams are resistant to damage from earthquakes. However, inadequate quality control during construction can lead to poor compaction and sand in the embankment which can lead to liquefaction of the rock-fill during an earthquake. Liquefaction potential can be reduced by keeping susceptible material from being saturated, and by providing adequate compaction during construction. An example of a rock-fill dam is New Melones Dam in California. Earth-fill dams, also called earthen, rolled-earth or simply earth dams, are constructed as a simple embankment of well compacted earth. A homogeneous rolled-earth dam is entirely constructed of one type of material but may contain a drain layer to collect seep water. A zoned-earth dam has distinct parts or zones of dissimilar material, typically a locally plentiful shell with a watertight clay core. Modern zoned-earth embankments employ filter and drain zones to collect and remove seep water and preserve the integrity of the downstream shell zone. An outdated method of zoned earth dam construction utilized a hydraulic fill to produce a watertight core. Rolled-earth dams may also employ a watertight facing or core in the manner of a rock-fill dam. An interesting type of temporary earth dam occasionally used in high latitudes is the frozen-core dam, in which a coolant is circulated through pipes inside the dam to maintain a watertight region of permafrost within it. Because earthen dams can be constructed from materials found on-site or nearby, they can be very cost-effective in regions where the cost of producing or bringing in concrete would be prohibitive. A third type of embankment dam is built with asphalt concrete core. The majority of such dams are built with rock and or gravel as main fill material. Almost 100 dams of this design have now been built world- wide since the first dam was completed in 1962. All dams built have an excellent performance record. This type of asphalt is a viscoelastic, plastic material that can adjust to the movements and deformations imposed on the embankment as a whole and to settlements in the foundation. The flexible properties of the asphalt make such dams especially suited in earthquake regions. A cofferdam during the construction of locks at the Montgomery Point Lock and Dam. A cofferdam is a (usually temporary) barrier constructed to exclude water from an area that is normally submerged. Made commonly of wood, concrete or steel sheet piling, cofferdams are used to allow construction on the foundation of permanent dams, bridges, and similar structures. When the project is completed, the cofferdam may be demolished or removed. See also causeway and retaining wall. Common uses for cofferdams include construction and repair of off shore oil platforms. In such cases the cofferdam is fabricated from sheet steel and welded into place under water. Air is pumped into the space, displacing the water allowing a dry work environment below the surface. Upon completion the cofferdam is usually deconstructed unless the area requires continuous maintenance. 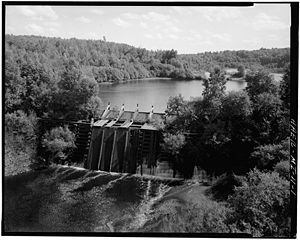 A timber crib dam in Michigan, photographed in 1978. Timber dams were widely used in the early part of the industrial revolution and in frontier areas due to ease and speed of construction. Rarely built in modern times by humans due to relatively short lifespan and limited height to which they can be built, timber dams must be kept constantly wet in order to maintain their water retention properties and limit deterioration by rot, similar to a barrel. The locations where timber dams are most economical to build are those where timber is plentiful, cement is costly or difficult to transport, and either a low head diversion dam is required or longevity is not an issue. Timber dams were once numerous, especially in the North American west, but most have failed, been hidden under earth embankments or been replaced with entirely new structures. Two common variations of timber dams were the crib and the plank. Timber crib dams were erected of heavy timbers or dressed logs in the manner of a log house and the interior filled with earth or rubble. The heavy crib structure supported the dam's face and the weight of the water. Timber plank dams were more elegant structures that employed a variety of construction methods utilizing heavy timbers to support a water retaining arrangement of planks. Very few timber dams are still in use. Timber, in the form of sticks, branches and withes, is the basic material used by beavers, often with the addition of mud or stones. 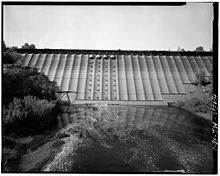 A steel dam is a type of dam briefly experimented with in around the turn of the nineteenth-twentieth century which uses steel plating (at an angle) and load bearing beams as the structure. Intended as permanent structures, steel dams were an (arguably failed) experiment to determine if a construction technique could be devised that was cheaper than masonry, concrete or earthworks, but sturdier than timber crib dams. Beavers create dams primarily out of mud and sticks to flood a particular habitable area. By flooding a parcel of land, beavers can navigate below or near the surface and remain relatively well hidden or protected from predators. The flooded region also allows beavers access to food, especially during the winter. Hydraulic turbine and electrical generator. As of 2005, hydroelectric power, mostly from dams, supplies some 19 percent of the world's electricity, and over 63 percent of renewable energy. Much of this is generated by large dams, although China uses small-scale hydro generation in many locations and is responsible for about 50 percent of world use of this type of power. 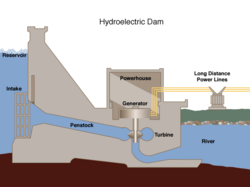 Most hydroelectric power comes from the potential energy of dammed water driving a water turbine and generator; to boost the power generation capabilities of a dam, the water may be run through a large pipe called a penstock before the turbine. A variant on this simple model uses pumped storage hydroelectricity to produce electricity to match periods of high and low demand, by moving water between reservoirs at different elevations. At times of low electrical demand, excess generation capacity is used to pump water into the higher reservoir. 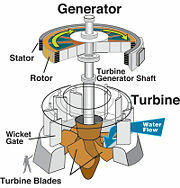 When there is higher demand, water is released back into the lower reservoir through a turbine. A spillway is a section of a dam designed to pass water from the upstream side of a dam to the downstream side. Many spillways have floodgates designed to control the flow through the spillway. Types of spillway include: A service spillway or primary spillway passes normal flow. An auxiliary spillway releases flow in excess of the capacity of the service spillway. An emergency spillway is designed for extreme conditions, such as a serious malfunction of the service spillway. A fuse plug spillway is a low embankment designed to be over topped and washed away in the event of a large flood. The spillway can be gradually eroded by water flow, including cavitation or turbulence of the water flowing over the spillway, leading to its failure. It was the inadequate design of the spillway which led to the 1889 over-topping of the South Fork Dam in Johnstown, Pennsylvania, resulting in the infamous Johnstown Flood (the "great flood of 1889"). Erosion rates are often monitored, and the risk is ordinarily minimized, by shaping the downstream face of the spillway into a curve that minimizes turbulent flow, such as an ogee curve. Hydroelectric power is a major source of electricity in the world. many countries have rivers with adequate water flow, that can be dammed for power generation purposes. For example, the Itaipu on the Paraná River in South America generates 14 GW and supplied 93 percent of the energy consumed by Paraguay and 20 percent of that consumed by Brazil as of 2005. Dams are often used to control and stabilize water flow, often for agricultural purposes and irrigation. Others such as the Berg Strait dam can help to stabilize or restore the water levels of inland lakes and seas, in this case the Aral Sea. Dams such as the Blackwater dam of Webster, New Hampshire and the Delta Works are created with flood control in mind. Dams (often called dikes or levees in this context) are used to prevent ingress of water to an area that would otherwise be submerged, allowing its reclamation for human use. A diversion dam diverts all or part of a river flow from its natural course into an artificial course or canal. The redirected flow may be used for irrigation, passed through hydroelectric generators, channeled into a different river, or dammed to form a reservoir. One of the best places for building a dam is a narrow part of a deep river valley; the valley sides can then act as natural walls. 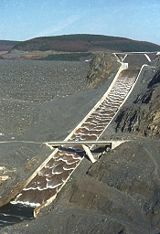 The primary function of the dam's structure is to fill the gap in the natural reservoir line left by the stream channel. The sites are usually those where the gap becomes a minimum for the required storage capacity. The most economical arrangement is often a composite structure such as a masonry dam flanked by earth embankments. The current use of the land to be flooded should be dispensable. the disruption of human lives, such as by relocation of peoples and the loss of archaeological and cultural artifacts underwater. Construction of a hydroelectric plant requires a long lead-time for site studies, hydrological studies, and impact assessment, and are large scale projects by comparison to traditional power generation based upon fossil fuels. The number of sites that can be economically developed for hydroelectric production is limited; new sites tend to be far from population centers and usually require extensive power transmission lines. Hydroelectric generation can be vulnerable to major changes in the climate, including variation of rainfall, ground and surface water levels, and glacial melt, causing additional expenditure for the extra capacity to ensure sufficient power is available in low water years. Once completed, a well-designed, well-maintained hydroelectric power plant is a comparatively cheap and reliable source of electricity. It is a renewable energy source that can be readily regulated to store water as needed and generate high power levels on demand. Dams affect many ecological aspects of a river. For example, a dam slows a river and affects the ecological pattern established by the river through its rate of flow. Also, rivers tend to have fairly homogeneous temperatures, but reservoirs have layered temperatures: warm on the top and cold on the bottom. In addition, because it is water from the colder (lower) layer of the reservoir that is often released downstream, it may have a different dissolved oxygen content than regular river water. Organisms depending upon a regular cycle of temperatures may be unable to adapt; the balance of other fauna (especially plant life and microscopic fauna) may be affected by the change of oxygen content. Older dams often lack a fish ladder, preventing many fish from moving upstream to their natural breeding grounds. This leads to failure of breeding cycles and blocks migration paths. Even with the presence of a fish ladder, there may be a reduction in the number of fish reaching their upstream spawning grounds. In some areas, young fish ("smolt") are transported downstream by barge during parts of the year. Researchers are actively working on turbine and power-plant designs that could have lower impacts on aquatic life. A large dam can cause the loss of entire ecospheres, including endangered and undiscovered species in the area, and replacement of the original environment by a new inland lake. Water exiting a turbine usually contains very little suspended sediment, which can lead to scouring of river beds and loss of riverbanks. For example, the daily cyclic flow variation caused by the Glen Canyon Dam contributed to sand bar erosion. Depending upon the circumstances, a dam may either increase or decrease the net production of greenhouse gases. An increase can occur if the reservoir created by the dam itself acts as a source of substantial amounts of potent greenhouse gases (such as methane and carbon dioxide), by the decay of plant material in flooded areas in an anaerobic environment. According to a report by the World Commission on Dams, when a relatively large reservoir is built with no prior clearing of forest in the flooded area, greenhouse gas emissions from the reservoir could be higher than those of a conventional, oil-fired power plant. On the other hand, a decrease of greenhouse gas emissions can occur if the dam is used in place of traditional power generation, because electricity produced from hydroelectric generation does not give rise to any flue gas emissions from fossil fuel combustion (including sulfur dioxide, nitric oxide, carbon monoxide, dust, and mercury from coal). The impacts of a dam on human society are also significant. For example, the Three Gorges Dam on the Yangtze River in China, is more than five times the size of the Hoover Dam (USA) and will create a reservoir 600 km long, to be used for hydro-power generation. Its construction led to the loss of over a million people's homes and their mass relocation, the loss of many valuable archaeological and cultural sites, as well as significant ecological changes. The reservoir emptying through the failed Teton Dam. International special sign for works and installations containing dangerous forces. Dam failures are generally catastrophic if the structure is breached or significantly damaged. Routine monitoring of seepage from drains in and around larger dams is necessary to anticipate any problems and permit remedial action before structural failures occur. 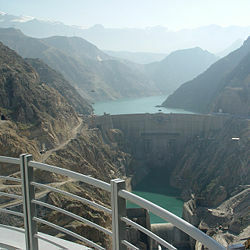 Most dams incorporate mechanisms to permit the reservoir level to be lowered or drained in the event of such problems. Another solution is rock grouting, that is, pressure-pumping portland cement slurry into weak, fractured rock. During an armed conflict, a dam is considered an "installation containing dangerous forces," because destruction of the dam could have a massive impact on the civilian population and environment. As such, it is protected by the rules of International Humanitarian Law (IHL) and shall not be made the object of attack if that could result in severe losses among the civilian population. To facilitate the identification of a dam, a protective sign is displayed, consisting of three bright orange circles aligned along a single axis, as defined by the rules of IHL. The main causes of dam failure include spillway design error (South Fork Dam), geological instability caused by changes to water levels during filling or poor surveying (Vajont Dam, Malpasset), poor maintenance, especially of outlet pipes (Lawn Lake Dam, Val di Stava Dam Collapse), extreme rainfall (Shakidor Dam), and human, computer, or design error (Buffalo Creek Flood, Dale Dike Reservoir, Taum Sauk pumped storage plant). Prior to the above IHL ruling, a notable case of deliberate dam failure was the British Royal Air Force Dambusters raid on Germany during World War II (codenamed "Operation Chastise"). In that raid, three German dams were selected to be breached to have an impact on German infrastructure and manufacturing and power capabilities deriving from the Ruhr and Eder rivers. This raid later became the basis for several films. ↑ Definition of "dam" bartleby.com. Retrieved October 7, 2007. ↑ Source: Tijdschrift voor Nederlandse Taal- en Letterkunde (Magazine for Dutch Language and Literature), 1947. The word dam was used by itself as far back as 1165, but one village, Obdam, was already mentioned in 1120. The word seems to be related to the Greek word taphos, meaning grave or grave hill. So the word should be understood as dike from dug out earth. The names of more than 40 places (with minor changes) from the Middle Dutch era (1150 - 1500 C.E.) such as Amsterdam (founded as 'Amstelredam' in the late twelfth century) and Rotterdam, also bear testimony to the use of the word in Middle Dutch at that time. ↑ 3.0 3.1 Mohamed Bazza.overview of the hystory of water resources and irrigation management in the near east region.fao.org. Retrieved October 7, 2007. ↑ 4.0 4.1 Bijker Wiebe. Dikes and Dams, Thick with Politics.ISIS. Retrieved October 7, 2007. ↑ Methodology and Technical Notes- iucn.org. Retrieved October 7, 2007. ↑ Arch Dam Forces. PBS Online. Retrieved October 7, 2007. ↑ 8.0 8.1 Renewables Global Status Report 2006 Update, REN21, 2006. Retrieved October 7, 2007. ↑ The Impact of Agricultural Development on Aquatic Systems and its Effect on the Epidemiology of Schistosomes in Rhodesia. "Recently, agricultural development has concentrated on soil and water conservation and resulted in the construction of a multitude of dams of various capacities which tend to stabilize water flow in rivers and provide a significant amount of permanent and stable bodies of water." . IUCN. Retrieved October 7, 2007. ↑ Kazakhstan Land and Water Development Division. 1998. "Construction of a dam (Berg Strait) to stabilize and increase the level of the northern part of the Aral Sea." Retrieved October 7, 2007. ↑ Blackwater Dam. US Army Corps of Engineers "The principal objective of the dam and reservoir is to protect downstream communities." Retrieved October 7, 2007. ↑ Batavians for a Healthy River - Dam Fact Sheet. Retrieved October 7, 2007. ↑ Duncan Graham-Rowe, Feb. 24, 2005, Hydroelectric power's dirty secret revealed New Scientist. Retrieved October 7, 2007. ↑ china-embassy,org. Three Gorges dam wall completed. May 20, 2006. Retrieved October 7, 2007. Fell, Robin, Patrick MacGregor, David Stapledon, and Graeme Bell. 2005. Geotechnical Engineering of Dams. London, UK: Taylor & Francis. ISBN 978-0415364409. Jackson, Donald C. 1996. Great American Bridges and Dams. New York: Wiley. ISBN 0471143855. Needham, Joseph. Science and Civilization in China, Vol. 4, Part 3. Taipei: Caves Books, Ltd. 1986. Siddiqui, Iqtidar. 2008. Dams and Reservoirs: Planning, Engineering and Maintenance. Oxford, UK: Oxford Univ Pr. ISBN 978-0195475852. Stevens, Joseph E. 1990. Hoover Dam: An American Adventure. Norman: University of Oklahoma Press. ISBN 0806122838.
International Commission on Large Dams (ICOLD). Dams and Retaining Structures. Nicolas Janberg's Structurae. This page was last modified on 17 November 2017, at 16:53.